Lao People's Democratic Republic is a small, landlocked country of almost seven million people. The country is one of the poorest in Southeast Asia and lacks adequate education, health services and infrastructure to fully support the development of its people. Since 2007, Catholic Relief Services has been working in Laos in partnership with the local government to ensure that all children have access to quality education. 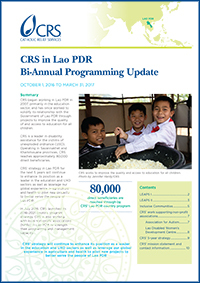 CRS began working in Laos in 1994 as an outreach program run from the Vietnam office and became an independent office in 2007. 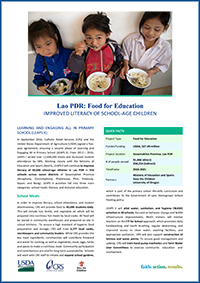 Education has been the primary focus of CRS’ commitment to development in Laos. CRS has focused on three main types of education programming: school feeding, inclusive education, and literacy development. In 2013, CRS was awarded a US Department of Agriculture McGovern-Dole Food for Education project, Learning and Engaging all in Primary School, in which CRS provided over 16 million free school meals to primary school children in 310 schools in the Savannakhet Province. In September 2016, CRS was awarded a follow-on five-year McGovern-Dole Food for Education project. 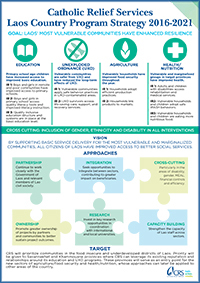 CRS works in 350 schools and provides assistance in four main programming areas: school meals, Water, Sanitation, and Hygiene promotion, literacy, and inclusive education. 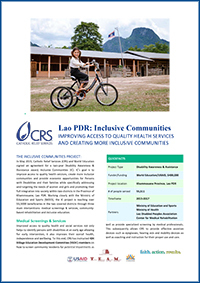 As a leader in the inclusive education sector in Laos, CRS has been a strong advocate in the effort to make education accessible to all children, especially for both boys and girls, children with disabilities, and non-Lao speaking children. Through the USAID-funded Inclusive Communities project, CRS trained 200 teacher and principals to create Individual Education Plans and how to create learning materials from locally available materials in order to better target children with special needs in a classroom. CRS also provided 189 assistive devices like hearing aids, wheelchairs, and eyeglasses and 37 surgeries to repair cataracts or cleft lips so that children would be better able to integrate into their school and community. Children from ethnic minority groups in Laos who do not speak Lao as their first language face increased challenges when they enter Grade 1 in primary school. 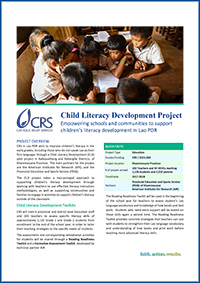 In 2016, CRS began its Child Literacy Development project with the goal to improve literacy outcomes for non-Lao speaking students through classroom-based and community-based activities. CRS trained 92 teachers and principals with monthly coaching visits and conducted formative assessments four times during the school for Grades 1 and 2 students. CRS also taught Village Education Development Committees and parents simple techniques to encourage literacy learning at home and within the community. With an estimated 270 million cluster bombs dropped in Laos during the Vietnam war, people in rural Laos live in risk of being maimed or killed by the effects of a war that happened more than two generations ago. CRS has responded with projects in Mine Risk Education to educate the public about the dangers of unexploded ordnance as well as Victims Assistance to train community members who are the usual first responders with life-saving first aid techniques when an accident happens. Through CRS’ current work in the education sector, CRS hopes to have a lasting positive impact on the lives of the children in Laos so that they will have a positive impact on Laos’ future.